Their structure – porous, irregular symbolizes soil – dry and cracked- was inspired by the paintings of Polish Grupa Nowohucka. The material used for its creation – paper – is being destroyed, broken into tiny pieces, which, in hot temperature again links into a new, completely different entity. “Paper” can be later shaped in many different ways and in its final form brings an association with nature, its source. When enabled, we’ll see a glowing and full of light planet. Globe takes part of a collection of lamps connected by the common name "Copernicus". Lamp is in 100 % recycled and eco-friendly. Supplied with textile cable and with ceiling cup made also with paper pulp. Handmade in Spain. The internal part of the lampshade has a particular pattern, different and unique in each lamp. Let us know if you need a longer cord, we will add it for you. Cords are available in many colors. You can choose them during placing the order. 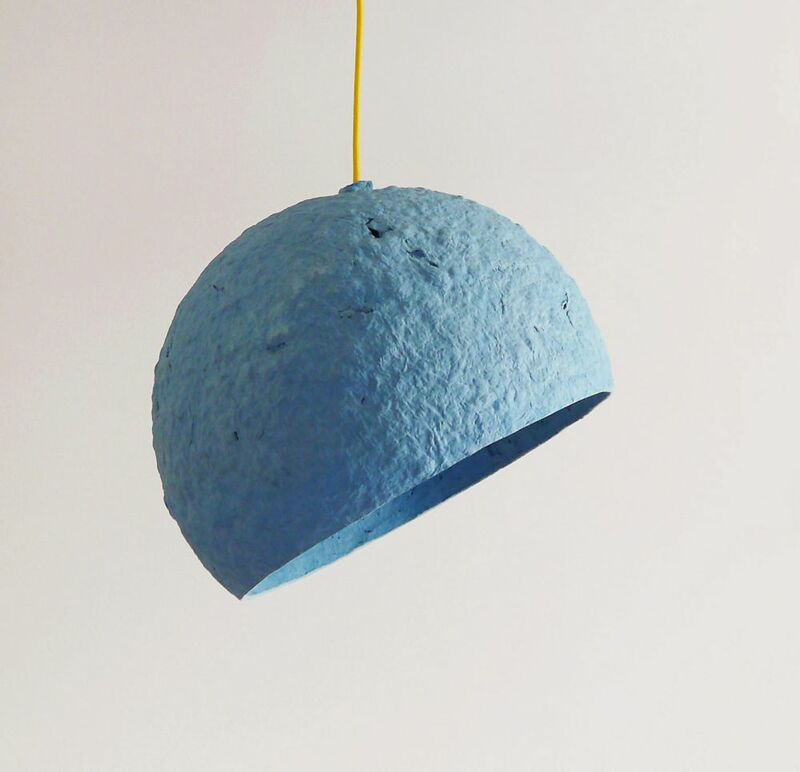 This paper pulp lamps are designed for use with LED or energy saving bulbs only. We recommend to use LED bulbs because those are safer than the energy saving bulbs. With this lampshade you can use the bulb with max. 20 Watt, it is totally safe then. The 20 Watt LED bulb makes as much light as 100 Watt incandescent traditional bulb. Normally we use 60 Watt incandescent bulb to illuminate our spaces, which is an equivalent of 11 Watt LED bulb. We suggest to use LED bulbs with warm white color - this color looks more natural than the cold white and is more similar to the color of traditional bulb. Our lamps require bulbs with E27 ending. You can clean our lamps with a dry brush or with a vacuum cleaner set at the lowest speed. The lamp is already assembled, all you need to do is to mount it on the ceiling. Lamp comes with a textile cable and a cable cup made also with paper mache. Cable cup has the same color as the lamp. All of our lamps are made for order. We will need around 2 weeks to prepare it for you. The lamp is packed into a solid cardboard box. We ship it with National Priority Mail or with the courier. All of our lamps are available in various colors. Please contact us if you wish to match the color of your lamp to your own interior design project. Creates ecological lighting from paper waste with traditional technique of papier mâché.